Want to be notified of new releases in CalvinHartwell/canonical-kubernetes-rancher? This repository has now moved and is no longer maintained, please check it out here: https://github.com/CanonicalLtd/canonical-kubernetes-third-party-integrations/tree/master/cdk-rancher. 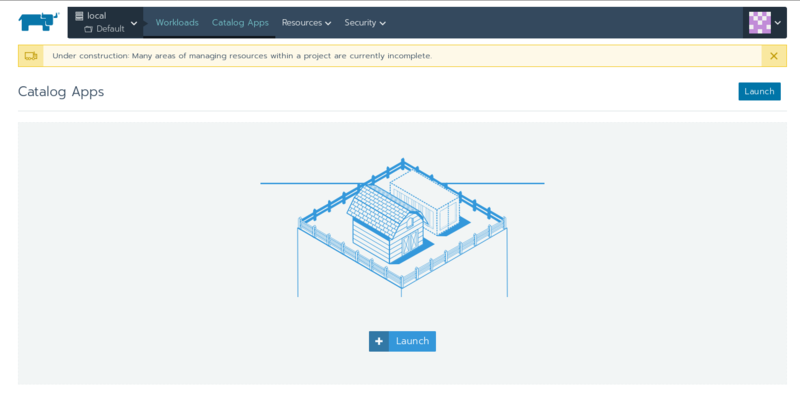 This repository explains how to deploy Rancher 2.0alpha on Canonical Kubernetes. These steps are currently in alpha/testing phase and will most likely change. - i-08ce69142f943b5a4 (arch=amd64 mem=4G cores=2)eu-west-1a"
Note that this will give you the default bundle for CDK which is made up of 9 machines, flannel networking and no RBAC. This is based on the default bundle found here: https://jujucharms.com/canonical-kubernetes/. For a more tailored build with Canal or Calico, you can use the bundle builder: https://github.com/juju-solutions/bundle-canonical-kubernetes. This will generate a bundle file, which is just a big piece of yaml which describes the configuration for the entire cluster, similar to an Ansible Playbook or Puppet Manifest. # If this does not work, try adding the --classic option on the end. Note: There are two other ways CDK would be deployed, either using Conjure-up or using the graphical juju-as-a-service tool provided at https://jujucharms.com/. To deploy Rancher, we just need to run the Rancher container workload on-top of Kubernetes. 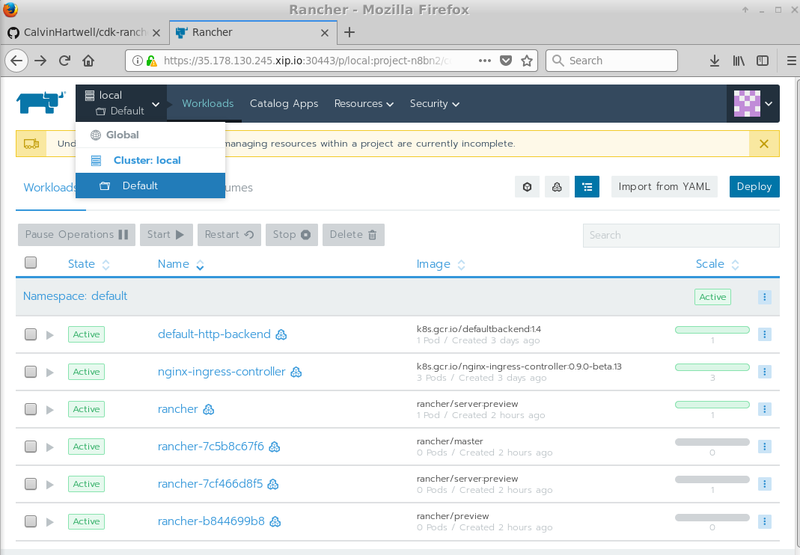 Rancher provides their containers through dockerhub (https://hub.docker.com/r/rancher/server/tags/) and can be downloaded freely from the internet. If you're running your own registry or have an offline deployment, the container should be downloaded and pushed to the private registry. # repeat this for each kubernetes worker in the cluster. juju run --unit kubernetes-worker/0 "open-port 30443"
juju run --unit kubernetes-worker/1 "open-port 30443"
juju run --unit kubernetes-worker/2 "open-port 30443"
Rancher can now be accessed on this port through a worker IP or DNS entries if you have created them. It is generally recommended that you create a DNS entry for each of the worker nodes in your cluster. For example, if you have three worker nodes and you own the domain example.com, you could create three A records, one for each worker in the cluster. easyrsa/0*                active    idle   0        35.178.118.232                            Certificate Authority connected. kubeapi-load-balancer/0*  active    idle   4        35.178.37.87    443/tcp                   Loadbalancer ready. kubernetes-master/0*      active    idle   5        35.177.239.237  6443/tcp                  Kubernetes master running. kubernetes-worker/0*      active    idle   6        35.178.130.245  80/tcp,443/tcp,30443/tcp  Kubernetes worker running. kubernetes-worker/1       active    idle   7        35.178.121.29   80/tcp,443/tcp,30443/tcp  Kubernetes worker running. kubernetes-worker/2       active    idle   8        35.177.144.76   80/tcp,443/tcp,30443/tcp  Kubernetes worker running. # Note the IP addresses for the kubernetes-workers in the example above. You should pick one of the public addresses. # replace the IP address with one of your Kubernetes worker, find this from juju status command. 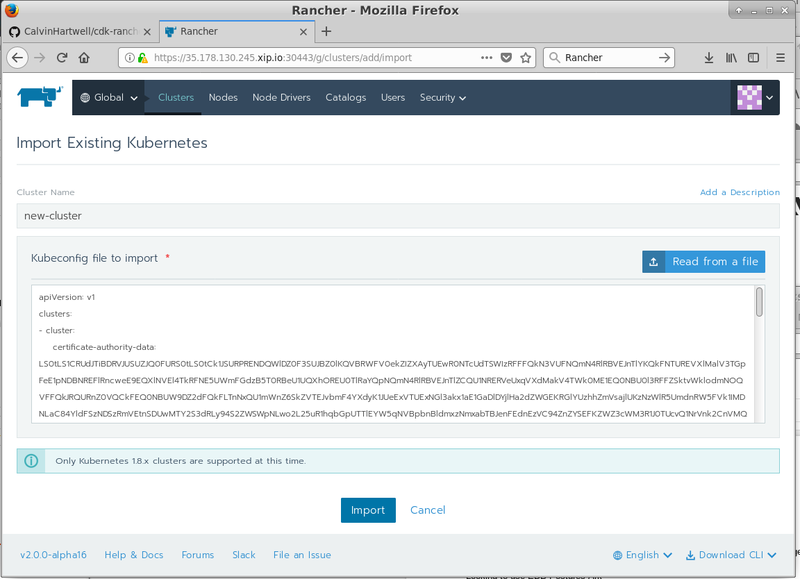 The cdk-rancher-ingress.yaml yaml file contains an example Kubernetes configuration for deploying Rancher with an ingress rule. If you use an ingress rule, you don't need to use the nodeport or open additional ports using juju. It is generally recommended that you create a DNS entry for each of the worker nodes in your cluster. For example, if you have three worker nodes and you own the domain example.com, you could create three A records, one for each worker in the cluster. # If you used the nodeport example change the yaml filename if you used the ingress example. 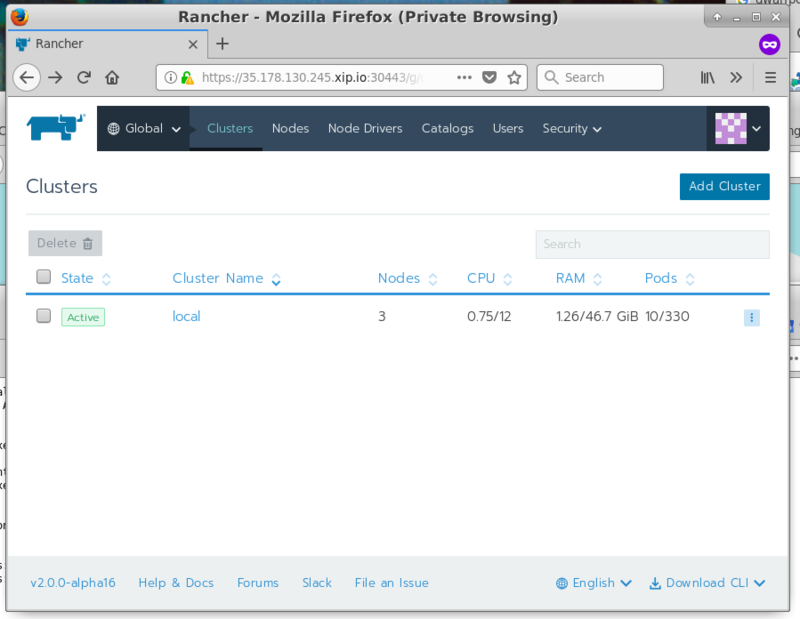 Rancher can be accessed using it's web interface but a CLI client is planned in the future. 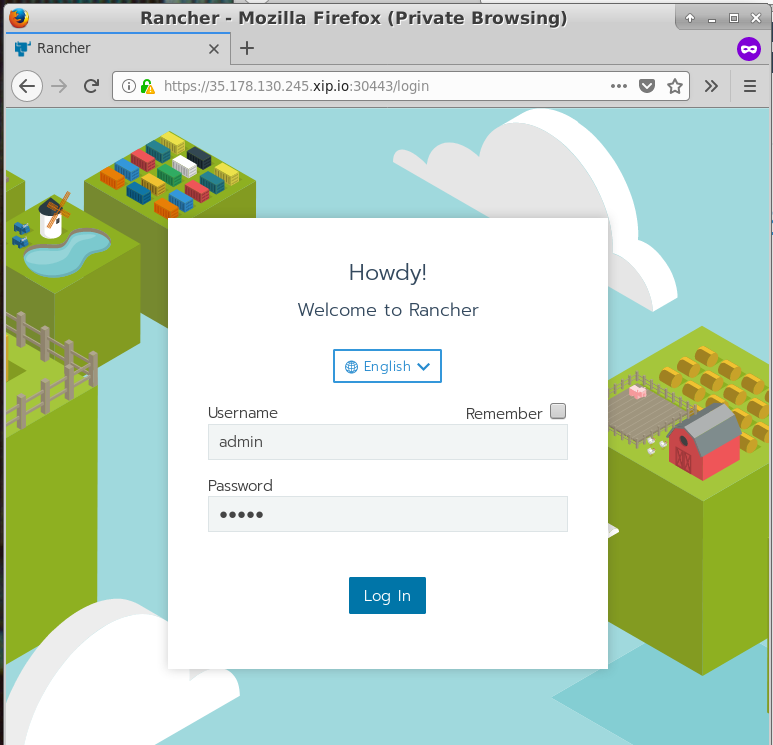 The best resource for using Rancher is the official manual found here: http://rancher.com/docs/rancher/v2.0/en/quick-start-guide/. The default username is admin and password is admin. You should be prompted to change them, it is recommended you use a strong password. The Rancher GUI has three main views, each of which has its own set of sub-menus. Global View: Provides a view of each of the Kubernetes clusters under Rancher's control. This provides a break down of Nodes, Node Drivers, Catalogs, Users and Security Settings. Cluster: This provides a view of of an individual Kubernetes cluster. It allows you to download the kubeconfig file for a cluster, check basic cluster stats, namespaces, projects, nodes and users for a particular cluster. Project: This provides a view for a project defined on a Kubernetes cluster. 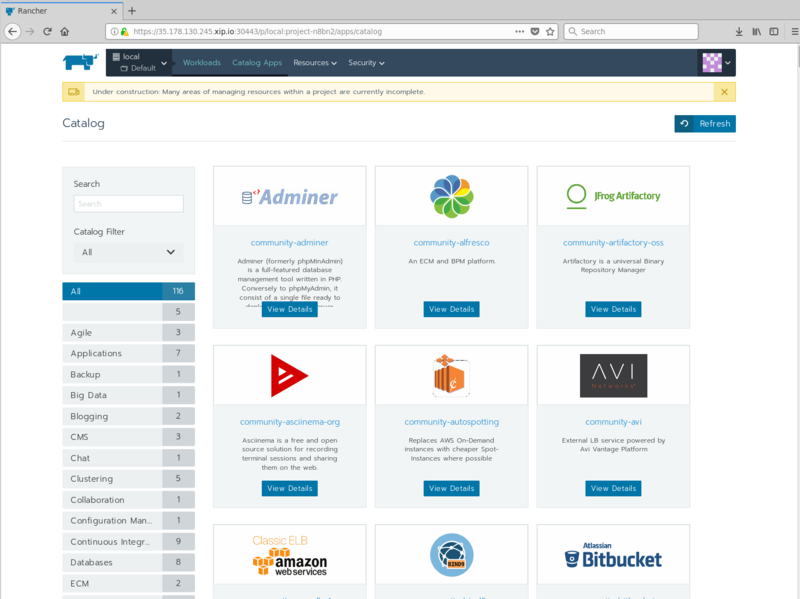 It allows you to configure workloads, DNS entries, ingress rules, volumes, secrets, registries, certificates and most importantly, the catalog. Essentially each of these different views is a drill-down from the top level. The Global view provides a high-level overview for all of the clusters it has control over, where as the project view is the lowest level you can drill down into within a cluster. Fill in details and then hit the Launch button. Congratulations, you've just ran your first Ubuntu workload on CDK using Rancher. # SSH into the Docker Container and check the container kernel version. The workloads interface can also be used to destroy, reprovision, clone and perform many other tasks on workloads running on Kubernetes. 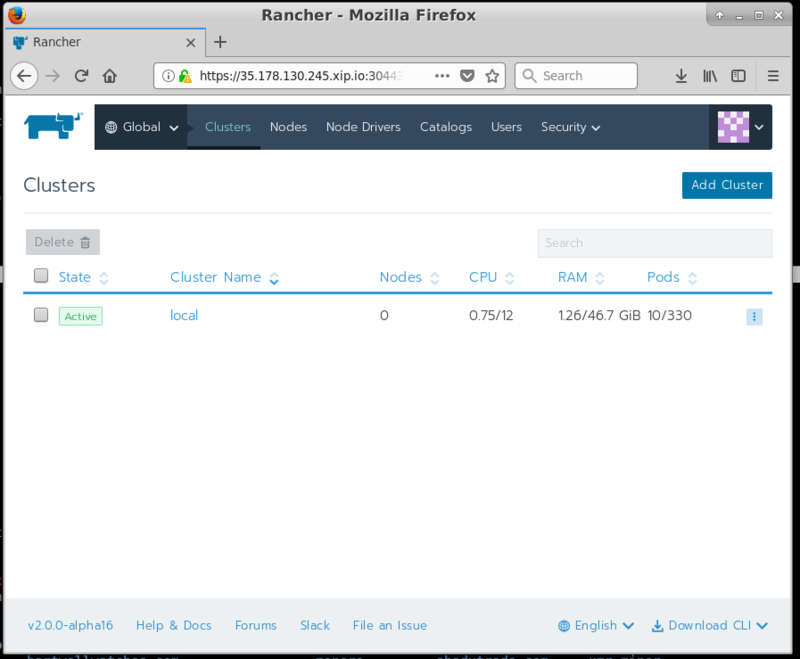 Rancher can also launch a workload using the Rancher catalog. First hover over the Global option in the top left-hand part of the menu. Once the menu appears, click Default at the bottom to select the Default project. 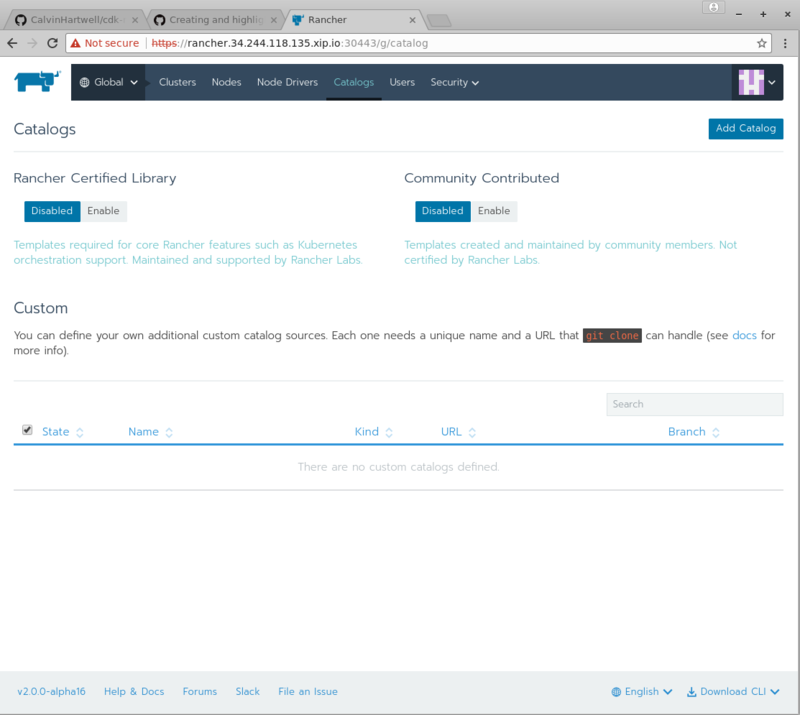 There are two buttons which read Disabled, one for Rancher certified Library and one for Community Contributed. Press both of these to Enable to continue. 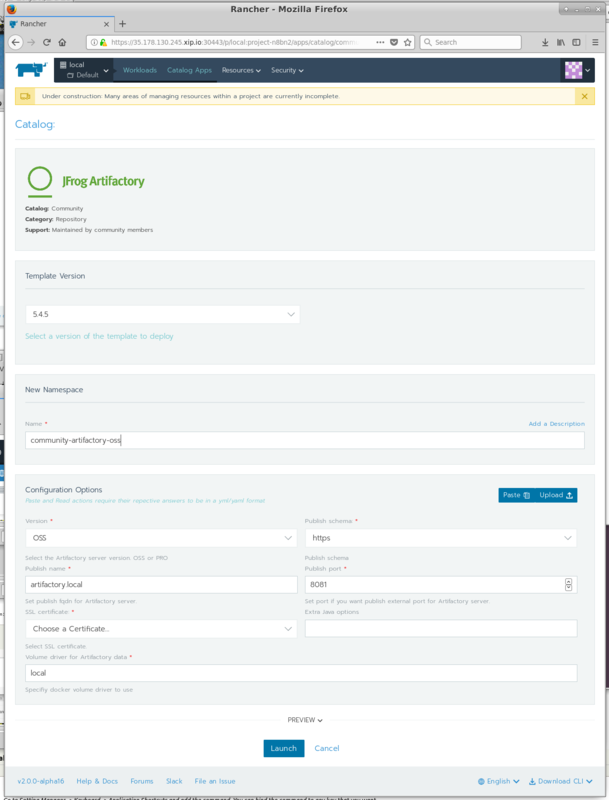 Rancher will now attempt to deploy Artifactory from the Helm Catalogue automatically on-top of Kubernetes. 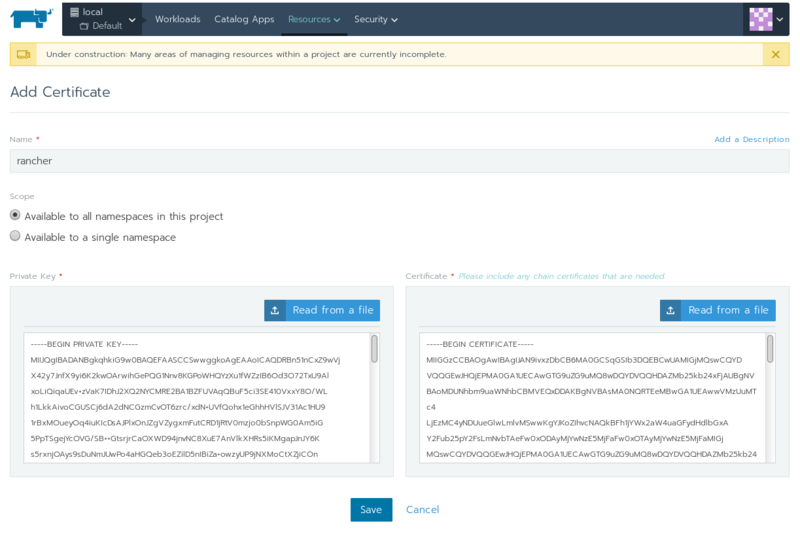 This next screen allows you to specify a name for the cluster and provide the kubeconfig file (the same configuration file used for kubectl) which is used to control and authenticate with the cluster. Give the new cluster a name and hit the Read from a file button to import your kubeconfig file or manually copy and paste the contents of the kubeconfig from its file. Note you will nee to SCP this file from your newly provisioned CDK cluster. # Replace the apply with your rancher yaml file. 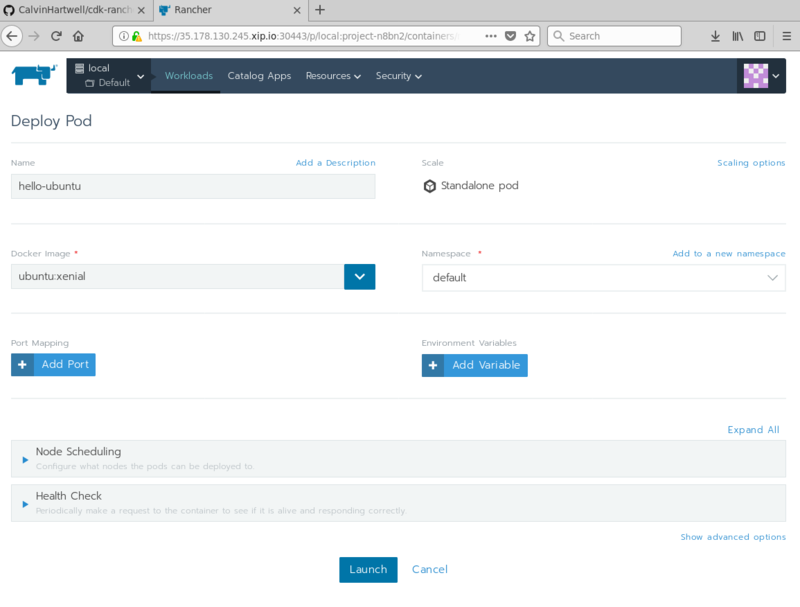 This documentation has explained how to configure and deploy Canonical Kubernetes with Rancher running on top. 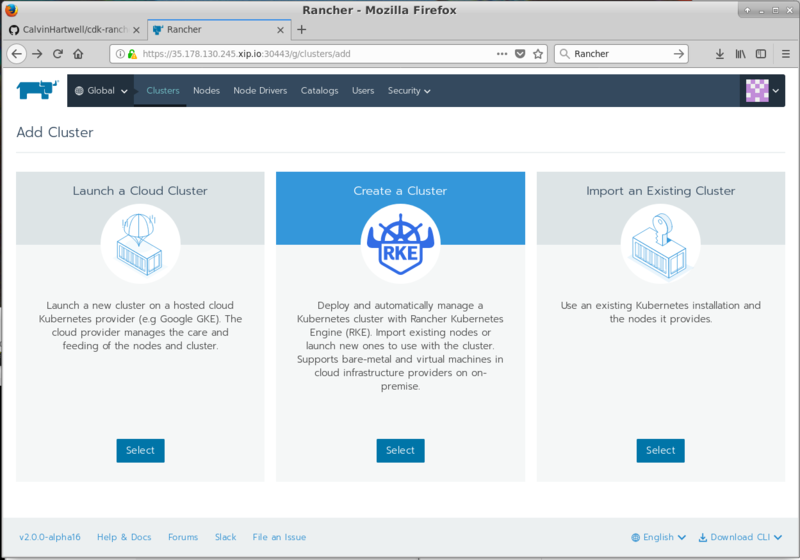 It also provided a short introduction on how to use Rancher to control and manage Canonical Kubernetes. Note that this documentation was written at the time of the Rancher 2.0 alpha but a beta release is due out very soon which would be a better release candidate for a production environment. This document was written by Calvin Hartwell, please feel to drop me an email on calvin.hartwell@canonical.com. To open issues with CDK, please open an issue with the repository here https://github.com/juju-solutions/bundle-canonical-kubernetes. If you want professional support for Kubernetes please contact Canonical Sales https://www.ubuntu.com/kubernetes. Rancher Provides support through Slack and by paid support https://rancher.com/support/. Please contact Rancher directly to get more help with their product.